San Ramon, CA, June 10, 2018: Straw Hat Pizza, the original California Pizza since 1959, announced it will introduce a Vegan Pizza in mid-June. The Garlic Artichoke Vegan Master Pizza is covered in Artichoke, Garlic, Red Onion and Tomato on a Vegan and Gluten Free crust covered with olive oil and vegan cheese. Straw Hat Pizza also has other vegan options including some appetizers and a market fresh salad bar. Vegan options are a growing segment of the pizza industry with many Generation Z and Millennial preferring a healthier, ethical diet that matches their view of the world. Another segment of the population also chooses vegan diets to lower their risk of diabetes and heart disease. 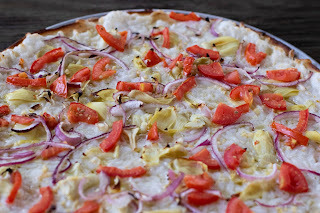 “The new Garlic Artichoke Vegan Master Pizza is a really tasty pizza. We hope it finds a core group of customers that enjoy it as much as we do. It is important to have options for all members of the family when they go out to eat.” said Scott Mason, Director of Operations for Straw Hat Restaurants, Inc. Opening its doors for the first time in San Leandro, a small town on San Francisco Bay, Straw Hat began serving its trailblazing “Genuine California Pizza” on July 10, 1959. It was an unrivaled pizza with a layered, flaky crust, the freshest toppings, light sauce, and six kinds of naturally aged cheese. Straw Hat Pizza has always been the place to go for family dinners, Birthday and Team Parties. The majority of our business is dine in. We provide a comfortable and fun environment to relax with family or friends. Our locations have games and televisions to provide entertainment. Straw Hat Pizza is in talks to sign a number of new franchise owners in California with locations opening in late 2018 and 2019. For more information about the franchise opportunity, visit the Straw Hat Pizza Franchise Page or call (833) 747-4992. Franchise Dynamics, founded in 2006, is the world’s largest full-service franchise sales outsourcing firm. Franchise Dynamics provides world-class franchise sales consulting and full-service franchise development. Franchise Dynamics’ team has been responsible for millions of dollars of franchise sales across various categories and investment levels. For more information about Franchise Dynamics, visit franchisedynamics.net or call (708) 798-1800.